Nestled in a valley between Mt. 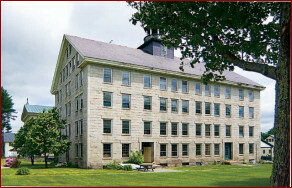 Assurance and Mascoma Lake, in Enfield, New Hampshire, the Enfield Shaker site has been cherished for over 200 years. At its peak in the mid 19th century, the community was home to three "Families" of Shakers. They practiced equality of the sexes and races, celibacy, pacifism and communal ownership of property. Shakers farmed over 3,000 acres of land, educated children in model schools and worshipped in the "Shaker Way."